This image is drawn by Steven Butler, a prolific penciller who has worked on titles as varying as Superman, Spider-Man, Badger, and Sonic The Hedgehog. 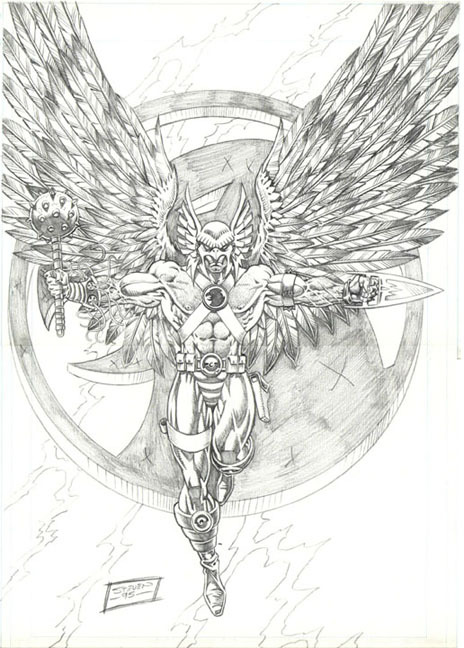 The image is described as a "cover tryout," for an unknown Hawkman series. Judging from the katar and the 1995 date, that puts it squarely in volume 3 territory. The feeling it gives me, though, is a volume 4 take, with the pouches on the belt plus the overly muscular body... never mind the feathered wings. Go figure. Of course it could be from the retractable wings period, too. Anyway, while as a cover this would make a dramatic and striking finished product, in it's current state it looks somewhat over-rendered, especially in the forearms. But I like the overall design of the cover quite a bit, and the wings and helmet look fantastic. The weapons also stand out very well. The right gauntlet is a nice touch as well. Disclaimer: I do not own or possess this sketch. I am reposting it from the credited site. Any Hawk-related goodies in the comic shops this week? Let's find out! Blackest Night: Rise of the Black Lanterns -- The Blackest Night issue of The Atom & Hawkman is collected in this volume, and Black Lantern Hawkman even makes the cover. I only read two of the issues collected here -- the other one was Weird Western Tales, which, oddly enough, ended up being important if you were reading Outsiders -- so I don't know if it is worth picking up or not. I know that the two I read I enjoyed. The Atom story is a good pickup for Ray Palmer fans for sure. Brightest Day Aftermath: The Search for Swamp Thing #2 -- Hawkman popped up on the cover to #1 but evidently did not play a role in the story, so who knows? I am not really interested in Swamp Thing presently so I am holding off on this series. DC Retroactive: Justice League of America: The 70s -- Well, Hawkman's on the cover and both Hawks were members of the League in the 70s (one earlier than another...), so I figure at least one of them should appear in either the new story or the reprint. I am not getting this particular issue but in general I like this concept and am looking forward to reading the ones I did pick up, including the ones for Flash and Wonder Woman. Flashpoint: Lois Lane and The Resistance #2 -- Hawkgirl being one of Wonder Woman's Furies means that she might appear in this issue -- another series I am not buying. Still just not feeling Flashpoint, folks. Generation: Silver Age Katar and Chayera? I guess? 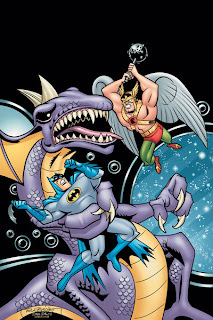 Summary: Hawkman and Batman stop the Thanagarian criminal Byth in his tracks (with a little help from The Atom! ), and imprison him in an energy cell to transport him back to prison. While in flight to Thanagar, Byth's compatriots attack the ship. At first Byth brags that he is going to be set free, but soon it becomes clear that his fellow gang members are out to make sure that he doesn't talk! Hawkman puts on a Thanagarian space suit and attacks the ships directly, while Batman fights them ship-to-ship. After a quick power failure, Byth escapes, but Bats disables him once again. With the attackers defeated, Hawkman checks in with Hawkgirl on Earth, who has decided to have a "Girl's Night" of crime-fighting with some friends! Review: Fun little TB&TB romp for The Dark Knight and The Winged Wonder. Hawkman looks like he did on the show, with the Honor Wings on his helmet plus the hawk silhouette. He looks powerful and colorful, the way he should in this series. The last page features Hawkgirl and her "girlfriends" including Wonder Woman and Supergirl, plus lots of classic Hawkfoes including I.Q., Fadeaway Man, Shadow-Thief, and Matter Master. The actual cover also features the excellent tagline "Showdown In Space!" Not the deepest story you'll ever read but worth picking up to get a classic sort of Hawk adventure. Big thanks to Mr P (Your Honor Wings are in the mail...) for letting me know about this one! "...this is a really fun project for me, I'm taking a character with a very complicated history, and streamlining him a bit, making it a good jump on point for new readers, but old readers will be able to recognize the character"
"My artist Philip Tan is doing amazing, amazing art. I've never seen someone so excited to draw..."
"We're gonna bring some new characters into Hawkman's world, introduce some new foes, a new nemesis who is an enemy equal to him"
"It's his Lex Luthor. his Joker." Jim Lee also added "[H]e draws all his pages in Starbucks, so all his pages are very caffeine driven." Sounds like Daniel is really jazzed to be working on this series. I have high hopes that this new take on Hawkman sticks and that the character soars to new heights (pun intended!). Well, at least the traditional Rogues are not going away entirely. Sort of a pat answer but at least jives with the general relaunch and what Daniel himself has said about his take on the Winged Wonder. A fan asks if Hawkgirl will be in HAWKMAN series. Phil Tan: "I can't talk about it." Sounds to me like Hawkgirl will play some role in some capacity, sort of admission through omission. Still eagerly awaiting September, folks! Any new Hawkstuff this week? Let's find out! Flashpoint: Wonder Woman And The Furies #2 -- Even though Hawkgirl did not play a role in the first issue, she might pop up in this one. While parts of the "DCnU" (ugh) relaunch have me excited, I cannot work up much interest in Flashpoint. I've read some synopsis and commentaries and I just feel blase about the entire event. I feel like I am just waiting out until the new books arrive at this point. Do you folks feel the same? 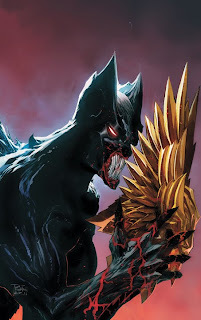 Nice article over on Newsarama -- Agent of STYLE: The Maces and Masks of Hawkman! Author Alan Kistler runs down the various nuances and appearances of Carter Hall and Katar Hol over the years as we build up momentum to the September re-launch. A bit long but definitely worth reading. Morphicus? Interesting. Looks like a mix of Man-Bat and a Dominator, but that seems unlikely. Certainly doesn't look like anything Thanagarian in origin, but maybe this guy could be related to Hawkworld from Brightest Day? We have to wait with bated breath until the books comes out! So what do you think? Does this second issue get you more or less excited about Savage Hawkman? Image: Savage Hawkman #2, 2011, Philip Tan. 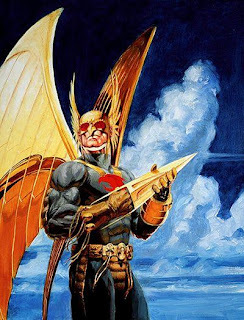 Sorry for the crummy post... but man, this is a cool image of Hawkman circa the early 90s, huh? 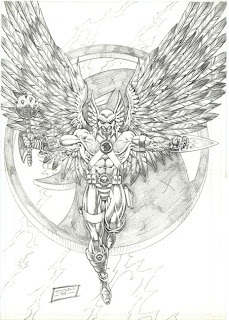 Image: 90's Hawkman, ??? ?, ???? As we continue to count down to the DCnU (ugh), is there anything with Hawkman or Hawkgirl gracing the stands? Let's find out! Blackest Night TP -- In case you missed it in single issues, then on the second printings, then on the Hardcover, you can now get Blackest Night in this softcover collection. I'd really like to pull the books out and read them again -- maybe that is a project for later in the summer? Of course considering how far behind I am on other projects that may not be a great idea. Any chance of finding something with the Winged Wonders this week? Let's take a peek! DC Direct Brightest Day Hawkman -- As I mentioned a while back, I got the Black Lantern Hawkman and Hawkgirl toys for my birthday, so if I can find their Brightest Day counterparts I might pick them up. Toy space is always a premium in my bonus room but Hawkman toys are always welcomed. Sorry folks, started a new project at work and between that and taking care of several projects around the house before the holiday, my blogging availability has been extremely scarce. I hope to get back into the full swing of things either this week or next. Sorry for any inconvenience!